One of Hollywood’s busier restaurants, Fat Sal’s, is recovering after a scary crash early this morning. The incident went down at 7:30 a.m. at the strip mall spot off Highland, and thankfully no one was seriously injured. 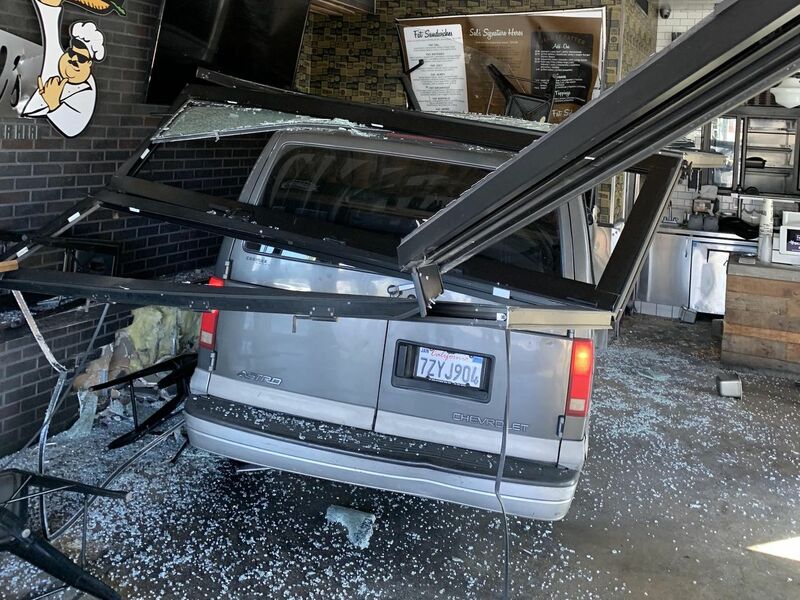 As the photo shows, a boxy van careened through the parking lot at Highland and Fountain, jumped the raised walkway, and made it all the way into the dining area. TMZ has video of the aftermath at the celebrity-frequented fast casual place, including lots of broken glass and furniture, but luckily no injured people. There was a morning prep team working in the back, but the restaurant itself doesn’t open to customers until 11 a.m., so the dining area was thankfully empty. According to reports the vehicle suffered some kind of “mechanical failure” before blasting through morning traffic and into the building. Reps for Fat Sal’s say they do not know when the corner strip mall restaurant will reopen. In the meantime, ownership also operates a smaller takeout food space just a few doors down in the same complex, so they’ll be sending diners to the window and offering some picnic tables for eating in the parking lot. There are several other locations of Fat Sal’s around greater Southern California as well, including a newer outlet up in Encino. Fat Sal’s. 1300 N. Highland Ave., Los Angeles, CA.